Heart Health Month is coming to a close. And so I thought there’s no better way to celebrate these few weeks of good health and good choices than to talk about salt-free, low-sodium bacon. Now I know that high-fat, high-calorie, high-sodium bacon is usually on the “don’t you touch that!” list for people watching their weight and cholesterol and overall health. And especially in light of the dramatic childhood obesity shift (did you read about this), I do feel a pang of guilt even promoting eating pork belly, i.e. one fatty cut of meat. Bacon has always been my low-sodium Goliath. An impossible salty challenge that continues to defeat me time and time again. And while I’ve made satisfying and healthful substitutions with sweet potato and even mushrooms, I’ve never come close to anything that I could confidently call “bacon.” I still haven’t. 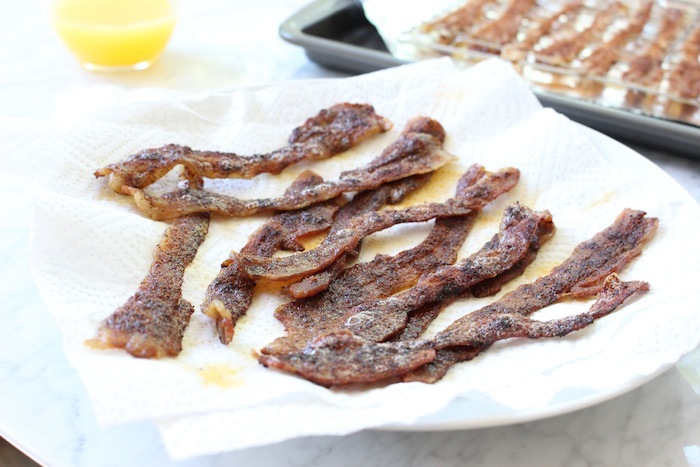 And that’s why, today, during the last week of Heart Health Month, I want to give you the recipe for salt-free, low-sodium, totally tastes like bacon BACON. Not so you can eat a whole pound of pork belly by yourself. But so you can do the impossible, defeat the last of the low-sodium Goliaths, and then share your winnings (bacon) with friends. Over brunch, of course. With salt-free bloody Marys. 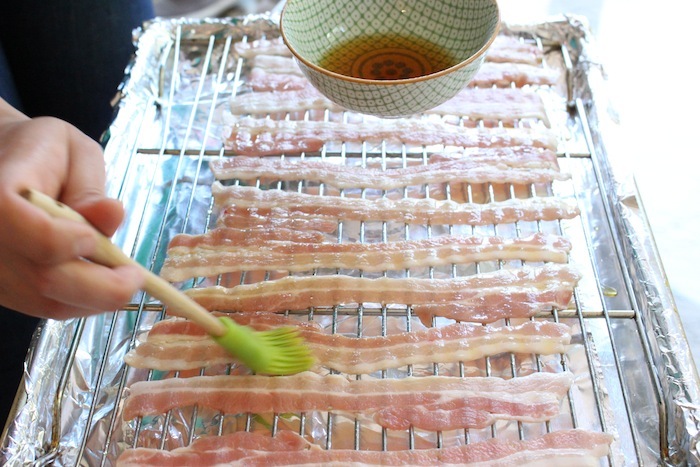 And hell, if you want to get really crazy, you can even dip those salt-free bacon strips in drink too. Although, that may just come off as bragging (which means you should go for it). So yeah. Today, I’m talking about bacon. 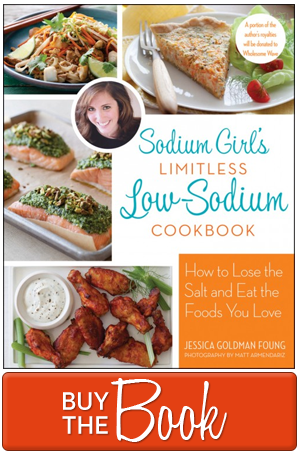 Because living low-sodium and living well means not only figuring out your food limitations, but also how to get around them. It means actively choosing to be healthy as well as happy. To take care of oneself and also take the time to have fun. To be diligent and playful. And to participate in your wellness and invite others to participate in your diet too. It’s about balance. And salt-free bacon. So let’s remember to make a fresh Brussels sprout salad on the side. Go for a nice long walk or run. Invite over friends. 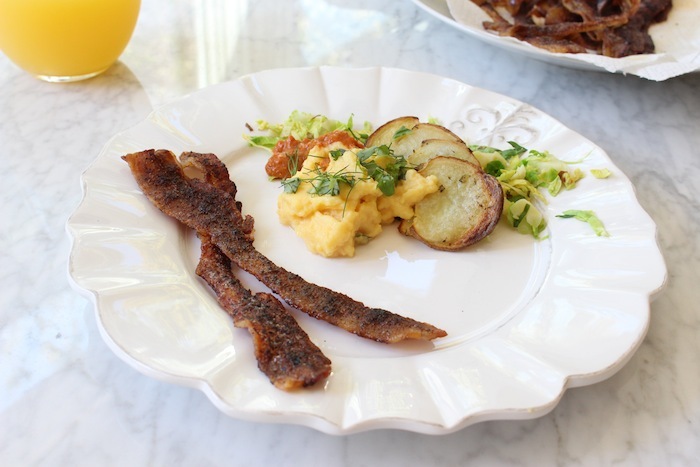 And give this salt-free bacon a try! 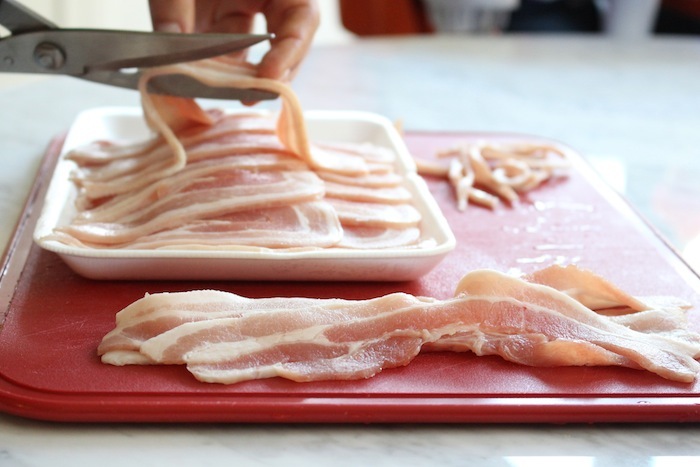 If you can purchase pre-sliced pork belly, that’s the easiest method. But if you can only buy a slab of pork belly, slice it as thin as possible with a sharp knife. You can also partially freeze the slab to make slicing easier. Either way though, both the uncut and pre-sliced pork belly still have skin on them. So use shears (or a very sharp knife) to remove just this top, thick layer of skin. 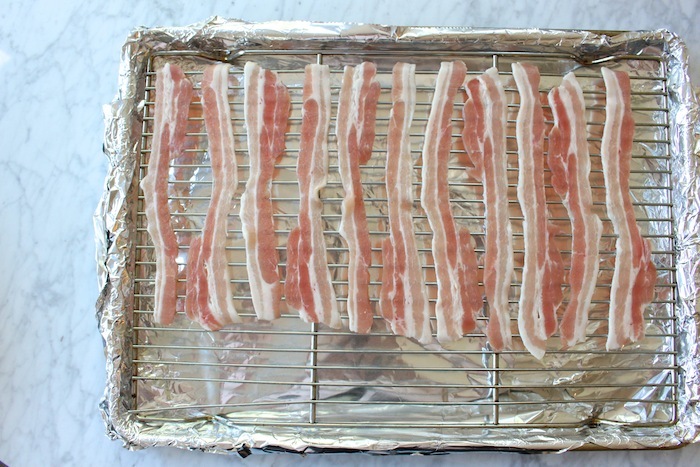 Preheat oven to 200dg F.
Cover two baking pans with tin foil and then place wire cooling racks (cookie sheets) on top. Place the prepared strips of pork belly on the cooling racks, careful to not over crowd (you’ll probably use two or three baking pans). Mix liquid smoke and maple syrup together in a small bowl. Note: if you’re leaving out the liquid smoke, just put the maple syrup in a bowl. In a separate bowl, mix the dry spices. Then, use a pastry brush to coat both sides of the pork belly strips with the maple syrup mixture. 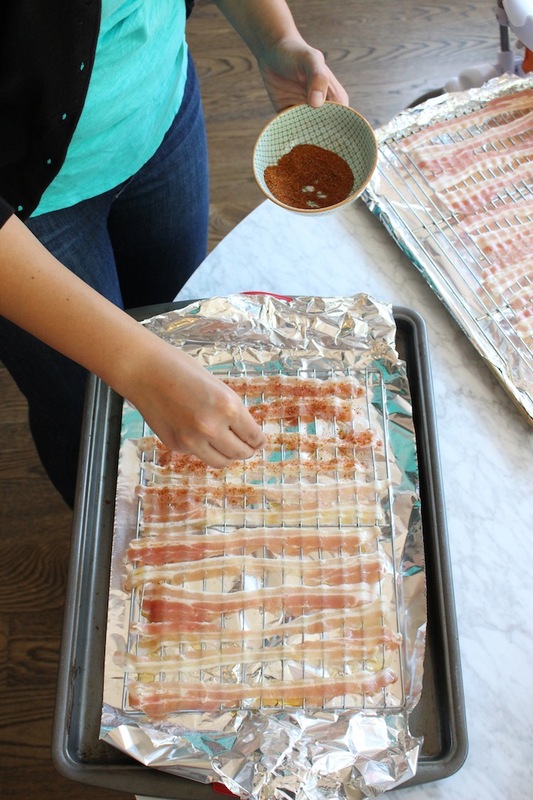 Sprinkle the spices on just one side of pork belly strips. And then throw those pork belly strips into the oven for 1 hour. Meanwhile, cover a plate with a paper towel and set aside. When the pork has cooked, remove the pans from the oven. 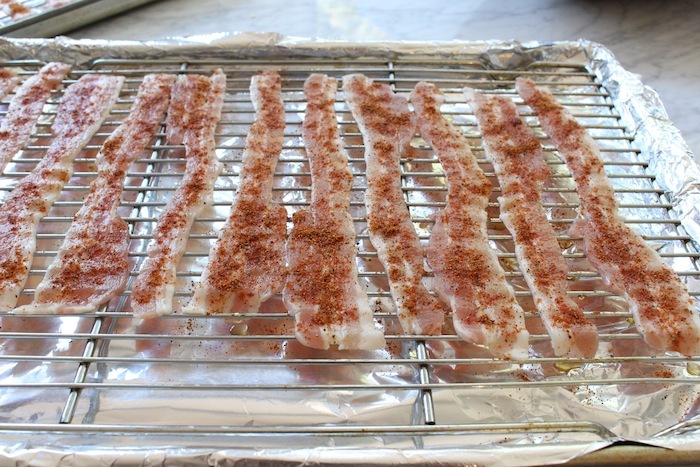 Then, use a large sauté pan or a cast iron skillet to fry a few bacon strips at a time over medium-high heat until crispy spots begin to show, about 2 minutes each side. 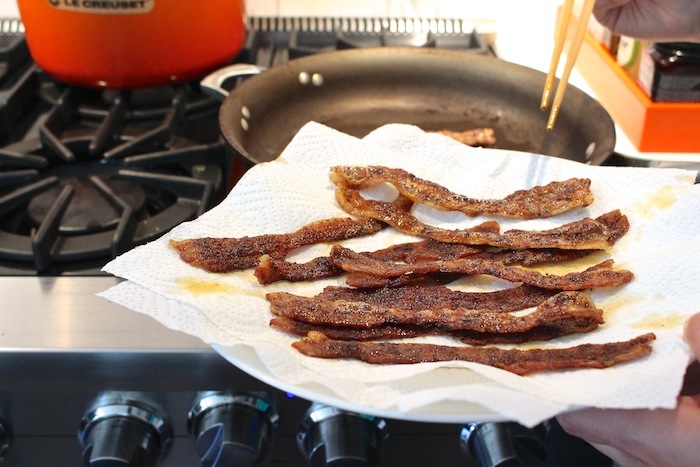 Use tongs or chopsticks to remove the bacon from skillet and place on the paper towel-lined plate. Continue until all the bacon is fried. I didn’t know I could eat pork belly on a low, low, low, 250 -300 mgs per day low sodium diet. If a whole lb of this stuff is 145 mgs, then a few slices certainly wouldn’t hurt. I miss eating bacon all the time. 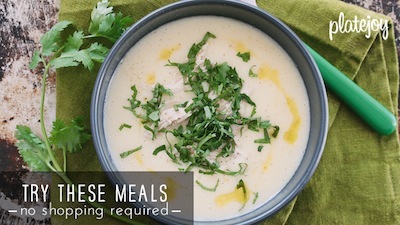 I can’t wait to try this recipe!!! FINALLY! Brilliant. Thank your sister-in-law for this brilliant invention, or re-invention lol. Great idea! Bacon always makes life better! This is a great idea! 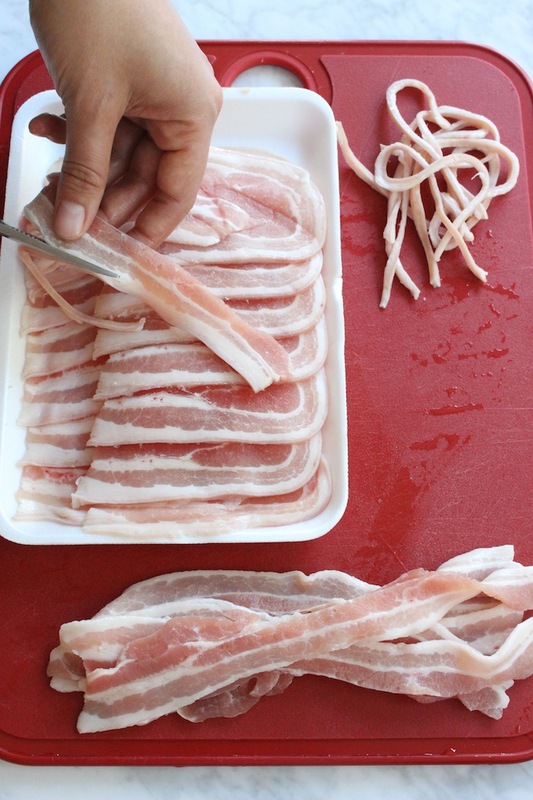 I never thought of using raw pork belly. Our super marker even has it pre-sliced. I made one adjustment. To save time, I put it in the oven at 400 degrees for 25 minutes. Came out golden and crispy! Finally, the Holy Grail of low sodium food has been discovered. I believe I might even have heard a Celestial Chorus when I started reading this. Could this be held after the initial bake time and crisped in the skillet when ready to eat? LOW SALT NICE BUT HOW MUCH _FAT_ IS IN THIS BACON ! ? LOW SALT NICE ! BUT ! 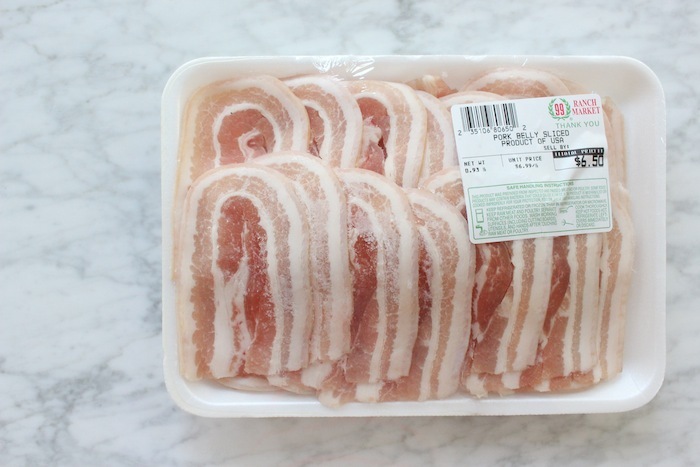 HOW MUCH FAT IN THIS BACON !